The video starts at Hurleston Junction, climbing the four locks from the Shropshire Union Canal. After passing Swanley Bridge Marina, the base of Cheshire Cat narrowboats, we continue the climb to Wrenbury, the base of Alvechurch Boats. The only staircase locks on the Llangollen Canal are at Grindley Brook, together with three single locks. This brings us to the Whitchurch Arm and the base of Viking Afloat. Onwards, through the lift bridges, we cover the Prees Branch to Dobsons Marina and onwards through the Ellesmere Tunnel to Ellesmere, passing Blackwater Meadow Marina, the base of Canaltime. We pass Frankton Junction and the Montgomery Canal, then the base of Maestermyn & Welsh Lady Cruisers & Mid Wales Narrowboats and the final locks at New Marton. Over the Chirk Aqueduct and through the Chirk Tunnel we pass Chirk Marina, base for Black Prince and Crest Narrowboats. Crossing the famous Pontcysyllte Aqueduct brings us to Trevor, base for Anglo Welsh. The final leg of the journey takes us to Llangollen. As a bonus, we cover the northern navigable section of the Montgomery Canal. We descend the locks from the Llangollen Canal at Frankton Junction and continue past Queen’s Head to Maesbury Marsh, the current limit of navigation from the north. 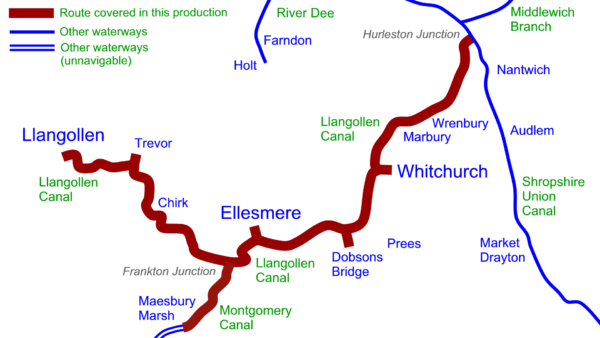 Route covered by the Llangollen Canal DVDs. 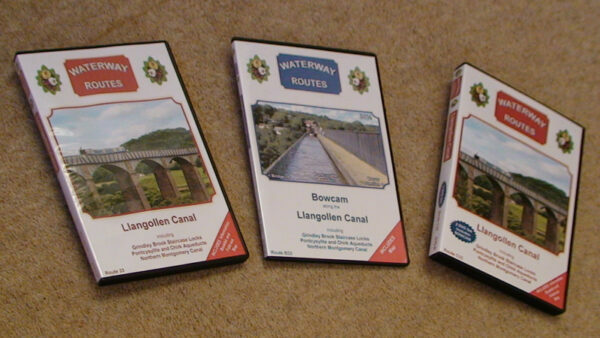 Llangollen Canal DVDs in a choice of formats. Contents of Llangollen Canal Combined DVD. 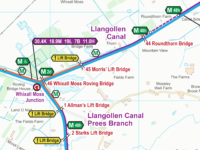 Extract from my Llangollen Canal Maps. 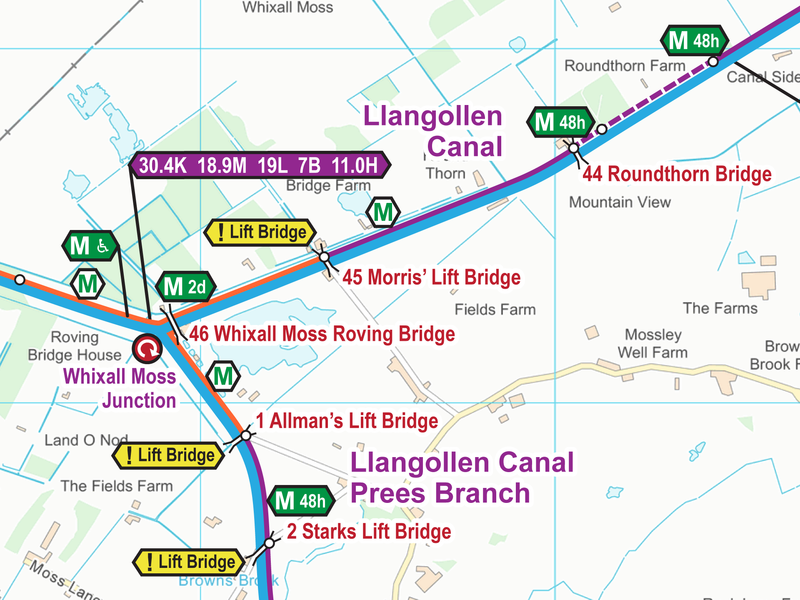 Read more about my Llangollen Canal Maps. 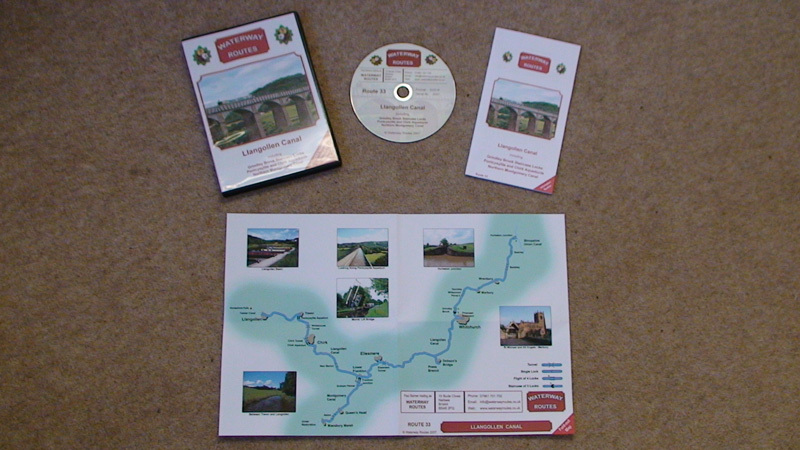 Save 10% on both when you buy a Llangollen Canal Map and DVD together. Automatically deducted at checkout.